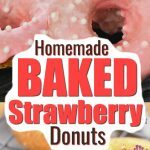 Homemade Baked Strawberry Donuts are the Perfect Treat! Donut aren’t an everyday thing, (like these incredibly fun Spiderman donuts), but they’re definitely a “I need these in my life” type of thing. Strawberry anything is always a fun treat for our family. Like these chocolate covered strawberries..
Or these strawberry cheesecake turnovers! But donuts definitely get there own “ahh-mazing” category. Because making homemade donuts is super easy. And if you make the baked version, they’re less messy too! Don’t get my wrong…I love me some fried donuts, but I don’t like flour and oil messes. Sorry..don”t hate me if you’re a die hard, fried donut fan. 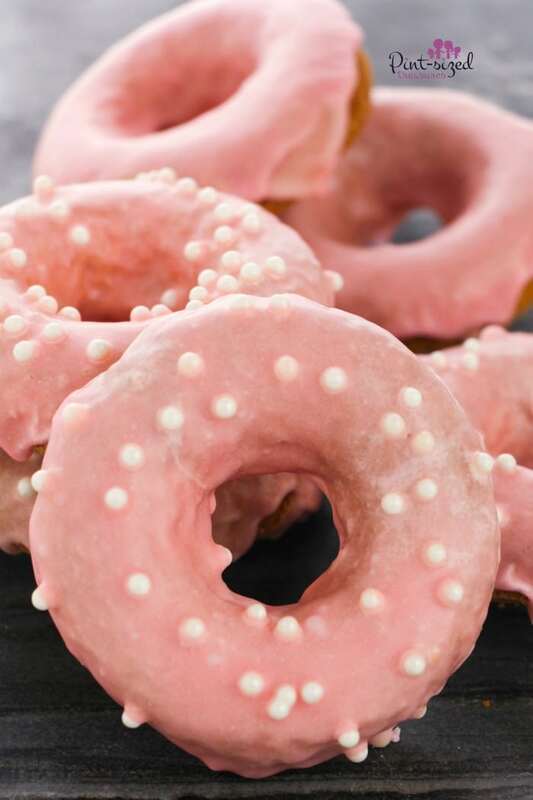 There are a lot of fun donut recipes that are made from a cake mix. Those are great for busy weekdays and crazy life seasons. But if you’re craving a super, homemade version you’ll love the recipe. You’ll need to get out your old-fashioned baking ingredients like flour, milk, vanilla, sugar and butter. Just those ingredients deserve a standing ovation from every foodie on the planet. You can make a crazy amount of goodies when you keep those ingredients stocked! Oooh..and did you notice this recipe comes with a homemade strawberry glaze? 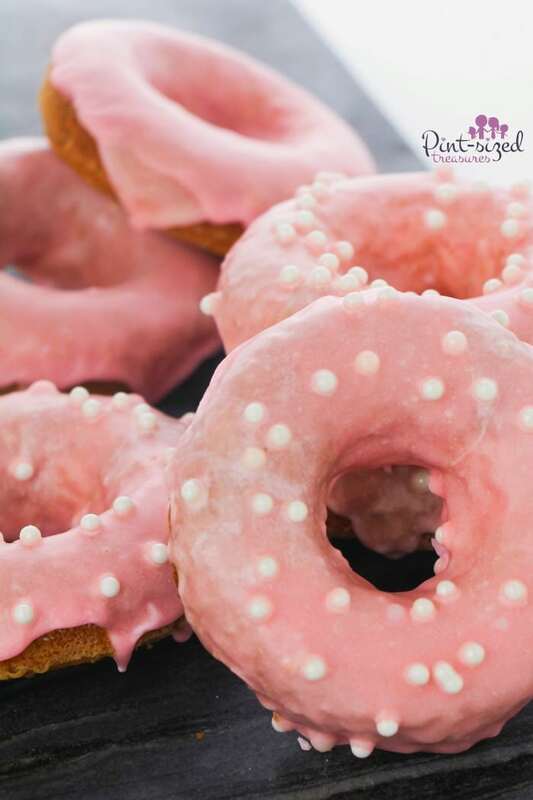 Gorgeous, pink drizzles of strawberry glaze will dribble down these perfectly baked donuts. And you can watch everyone’s smiles and reactions when they take their first bite..and second…and sixth. Go ahead and preheat your oven so you can start serving your family, friends and yourself some amazing, homemade baked donuts. Be sure to tell me how much you loved these! 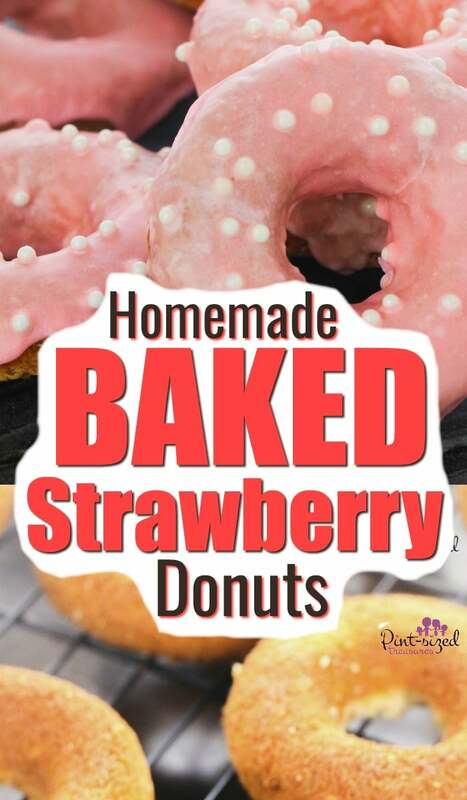 These homemade baked strawberry donuts are SO good and they're not from a cake mix! 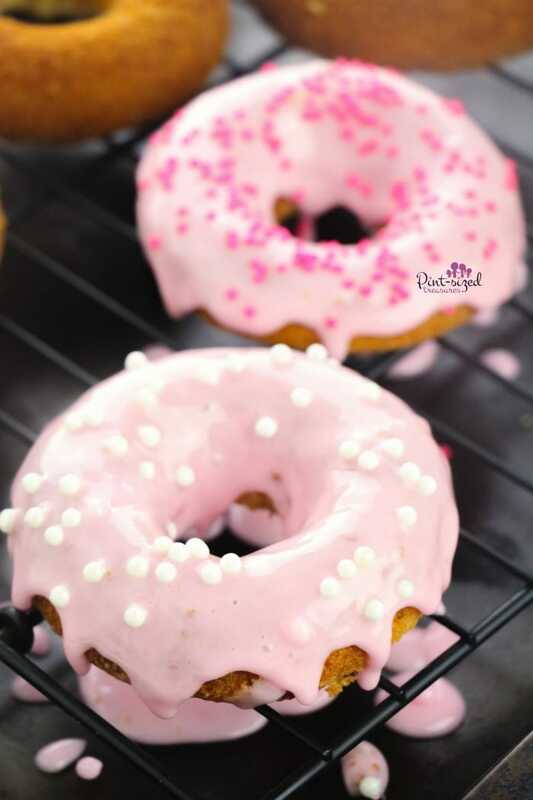 These incredibly easy, baked strawberry doughnuts come with a homemade, strawberry glaze that takes them up another notch not the amazing dessert scale! Spray your donut baking pan with nonstick cooking spray. 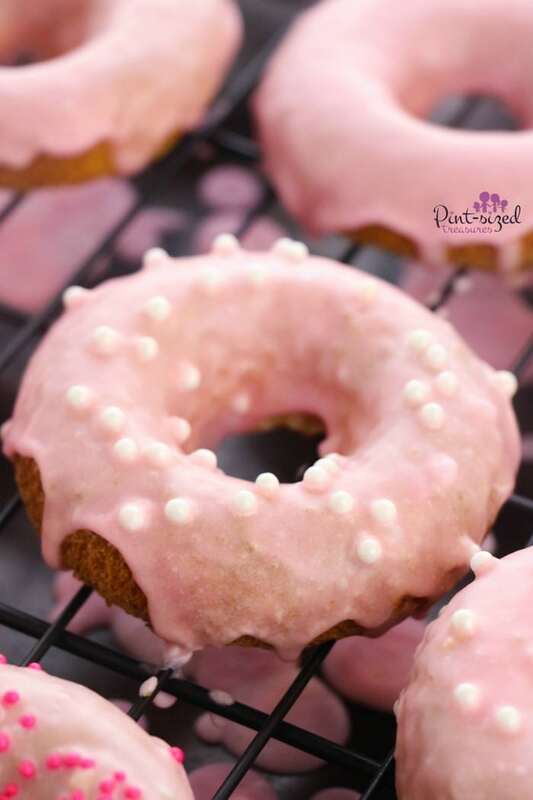 Set aside.Place a cooling rack over a baking tray for when you cool and decorate your donuts. Set aside. In a large bowl, stir together the flour, sugar, baking powder and salt. Set aside. In a small bowl, whisk together egg, milk, melted butter and vanilla extract. Add the wet ingredients to the dry ingredients and stir together until well combined. 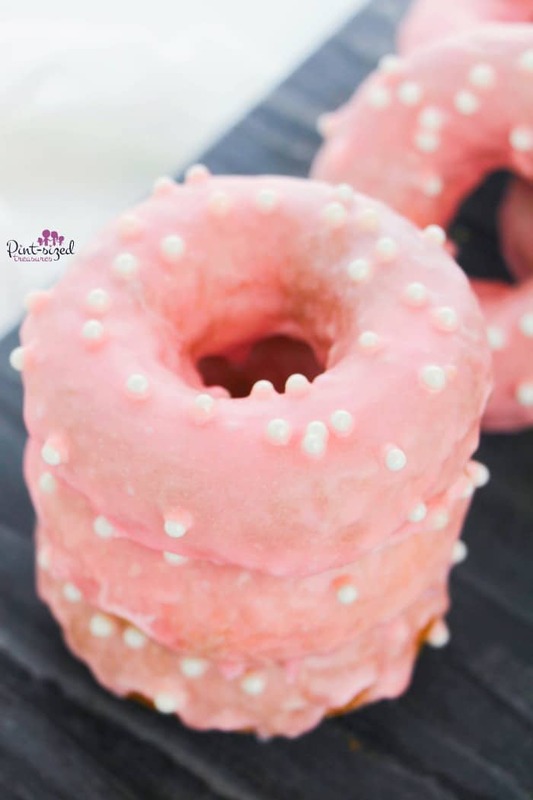 Do not overmix.You can use a measuring cup or piping bag to portion the batter into your donut pan - whatever you fill most comfortable with. You need to fill each cavity about 3/4 of the way full as they will rise when baking. Bake for 8 to 10 minutes, until an inserted toothpick comes out clean and the donuts are springy and golden brown. Allow the donuts to cool for 2 minutes before removing from the pan and placing on the prepared cooling rack. For the glaze, puree the strawberries in a blender until smooth. Place a fine mesh sieve above a bowl or measuring cup and pour the strawberries in. You can discard what the sieve catches or use it in another recipe. Pour the strained strawberry puree into a small bowl and add confectioner's sugar until you form a dippable icing. I also had to add about a tablespoon of cream, but adjust as needed. The strawberries add a faint pink color to the icing but I amped it up with a bit of pink dye. Dip each donut into the glaze, hold above the bowl to let the glaze drip off, and then re-dip to get a thick coating. Place the dipped donut on the cooling rack and immediately sprinkle on your choice of sprinkles. Let dry before packaging or serving.